Extra high content of polyunsaturated Omega-3 fatty acids EPA and DHA (eicosapentaenoic acid and docosahexaenoic acid). 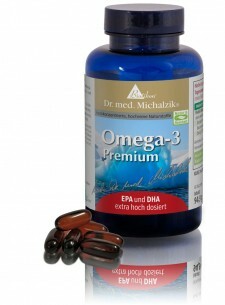 Omega 3 Premium by Dr. Alexander Michalzik M.D. is obtained from Alaskan salmon. This product is characterized by its extra high content of the polyunsaturated Omega-3 fatty acids EPA and DHA (eicosapentaenoic acid and docosahexaenoic acid). This new product replaces our previous product "Omega-III plus". It contains twice as much EPA and DHA for the same price. DHA contributes to maintaining normal heart function. Omega III Premium by Dr. Michalzik is subject to strict examinations of German supervisory authorities. It is manufactured by use of gentle production technologies without heat or additives and without the use of processing agents which are not required to be mentioned on the packaging. Packaging made of PET, therefore without plasticizers. Adults, 1 capsule with some liquid. 60 capsules, each capsule containing 1,000 mg pure fish oil concentrate from Alaska salmon. Do not take if allergic to fish or crustaceans. High dose premium fish oil concentrate in a special stomach acid resistant capsule capsule.